1978 LP from English pop/ folk singer Julie Covington, with a well-chosen selection of covers, including a version of "Sip the Wine" from Rick Danko's self-titled 1977 solo album. On Julie Covington, Tim Drummond is credited for "Sip the Wine" instead of Rick Danko. 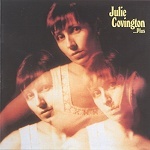 The 2000 CD reissue Julie Covington ...plus has two bonus tracks which were originally released as the single "Only Women Bleed" / "Easy To Slip" (Virgin VS 196) in 1977.